The lot to the right has leaves going down. Stepping to the top step of the porch to let Ellie B aka Dogamous Pyle out to do her backyard morning thing, I couldn’t help but look right and left to check out autumn’s progress in the Syracuse city neighborhood of Eastwood. The empty lot to the right has a brightly yellowed tree hiding out on the back line, with a hint of orange trying to make a statement, too. Many of the leaves have already fallen to the grass. Yellow and orange to the left. Off to Good Neighbor Tim’s left side, his white birch hugging his house has gone yellow-toward-brown. Off past his workshop, though, a tree in the backyard on the next street is making a much more colorful statement. I’d even declare red winning the battle to be the primary color. White daisies still blooming in the butterfly garden. 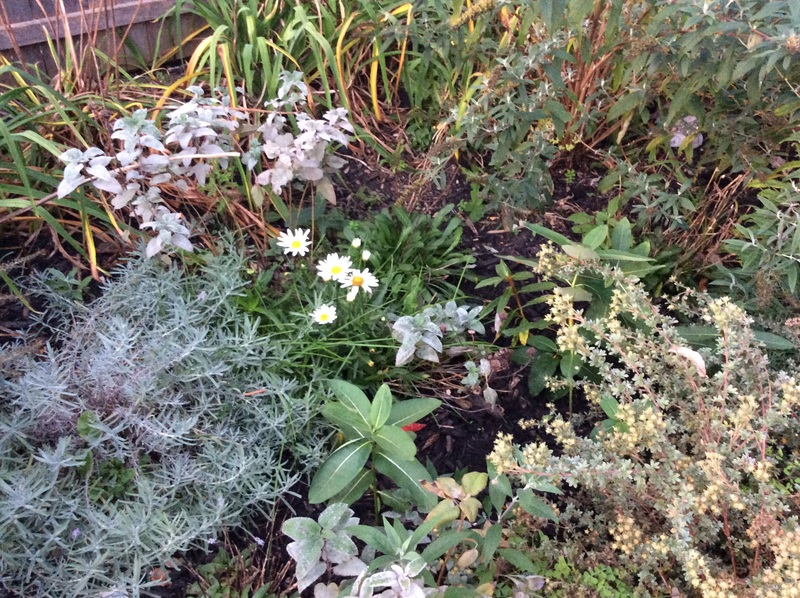 Straight back in our butterfly garden, meanwhile, a daisy plant refuses to give up its rightful place in the seasonal sun, still pushing out white blossoms. That earns a mid-October hurrah in Central New York amid the changing leaves. What percentage turned-to-autumn do you think it is in your part of our world? Go to one of your doors, look left and right, and what do you see? Do you consider yourself the type that goes through life looking straight ahead, or meandering sideways sometimes, and wouldn’t you love to share a story about going the opposite way than usual? Hi, Mark! Great post. To answer your questions: (1) I’m guessing about 15 to 20%, right now (2) I see friendly neighbors (3) I consider myself the meandering type (4) I always love to share stories and music, too, and I’m not sure if this goes in the opposite way than usual, but I’m going to try to post a link to a song here. Well you know this was the inspiration for my headline, Ann, because you get me! I am the meandering type. In P-town this summer my Life Is Good T-shirt purchase was: He Who Wanders Is Not Always Lost. Enough said right there, agreed?! You and I both probably agree that there’s often never enough said, Mark! In any case, I’m going to say this: your P-town t-shirt saying showed up (slightly differently) on a sign in a recent blog post of mine (from Edinburgh, Scotland). I had to click on the very last photo itself to enlarge it and actually read the red sign to get the exactitude with me shirt, Ann. Thanks for looking out for that, Mark. Thanks Ann, this is my all time favorite CCR song. I’m even happier that I posted it! Definitely meandering here, too. We are maybe 15% into fall color right now? Who knows, I’m judging by my own yard which has giant old oaks that don’t drop their leaves until Thanksgiving. they are still 90% green. Think of us in November….up to our eyebrows in leaves….. I will think of you rakishly, Barbara, as I ready for turkey and trimmings. Up to three years ago we had a silver maple in our backyard that I called the biggest tree in Eastwood. It was HUGE. It doubled its height in the first seven years we lived here, I estimated, and it was the biggest tree on the block when we moved in. Its many leaves that canopied the entire lot and then some used to stay green until November, just like your mighty oaks. Fortunately, we have many trees still surrounding our yard to still provide shade. You had no choice. I remember you mentioning this tree to me before. Sometimes you just have to be ruthless in order to save life and limb, no pun intended! Rakish thoughts, indeed. LOL! I think upwards of 70% have started to turn. I noticed on my last mini hike the other day that some trees are full blown yellow and orange and half of their leaves are down. Other trees have turned a muted greenish brown. Others have bright patches of red amidst the green still stubbornly claiming their right to be. It won’t be much longer. We will have a short window of full brilliant color bursting trees. Then….wooooshhhhhh…..gone to sleep for the winter. The big sleep is just around the corner, Colleen, and I will mourn during the hibernation. Your dream home will be fantastic during the winter, Colleen. Summer, too, for that matter. Very cool, naturally! Naturally. We hope to utilize more of the outside as part of our living space. Why must we be inside so much??? Love going for a wander. Sort of autumn here but still really warm. I am looking forward to crisp autumn days. Your garden is still looking great – can’t believe the summer has been and gone already! We had lots of days in the 70s this week, even a couple in the 80s, Rachel. The plants are confused. But this morning I heard the furnace kick on a few times, so it must have dipped back down to autumn like normal. Yay. It’s time. A delicious time of year and a treat to look out your back window with you.. Thanks, Mimi. And consider this a little poke to the ribs. You gotta write, my friend. I mean, you have so much great stuff to share with us, I know. Please. You’re a very wonderful friend Mark – I’ll be back – been a little under the weather that’s all..
That saddens me to hear that, Mimi. Get better and quick, my friend. I love the vibrant colours in your neck of the woods Mark! Here in western Canada, it’s mostly yellow but I remember the beautiful maple trees of my home province – it was stunningly beautiful! Western states would be the same I imagine? I can only imagine, too. I’ll ask my wife about California! Yeah I’ll just tell you, it’s like dessert with imported palm trees! Wait I’ve never been to northern CA though – I take it back. I’ve been from San Diego to San Francisco and it’s watered spots of green between arid brown, you are correct. Lunar, almost, except for where man took over the irrigation, Diana. I think we are up to 70% or more. It happened almost overnight. If the kid goes on the road today, it will be interesting to get his take on the changeover since he will going through the mountains vs. me trying to compare a tree here and there. M will see a gorgeous pass through the mountains, I bet, Jeanette. Great timing for that drive! Yes, it’s getting more colorful and beautiful by the day, isn’t it Mark? i was sitting on the front step yesterday admiring the colors and, as you say, looking all around. Over my head, the maple leaves closest to the house and lowest on the branches are still an even more brilliant green seemingly brighter than all summer. Above them is yellow sprinkled with orange, with a few empty branches at the top. The sidewalk and front walk are buried under leaves. Aross the street there is a small maple no higher than 7 feet and it had turned completely red and all the leaves fell off in a ring around the tree. There are white plants under the little tree and now they have a red ring around them – it is so gorgeous. It’s been warm here this week too – between 70 and 80 during the day. Nights have been cooler but it has rained a lot.the last few nights and days. Much cooler and cloudy today. Neat post Mark and I loved the pictures. Thanks for sharing your view up there, Paul. It sounds like a lovely panaorama to me, my friend. Up and all around! Autumn is beautiful time of year, Chum. The colors are some of my favorites. Enjoyed the lovely photos. The bright orange bush towards the top is my fav. Gorgeous. Hey, thanks. That was something…huh?!! Yay! Okies beat themselves. Our gain, I guess. No, Okies let you beat them! That’s even better, Red. 🙂 Wooooo-hoooooo! I LOVE autumn, and i would say I’m a meanderer! 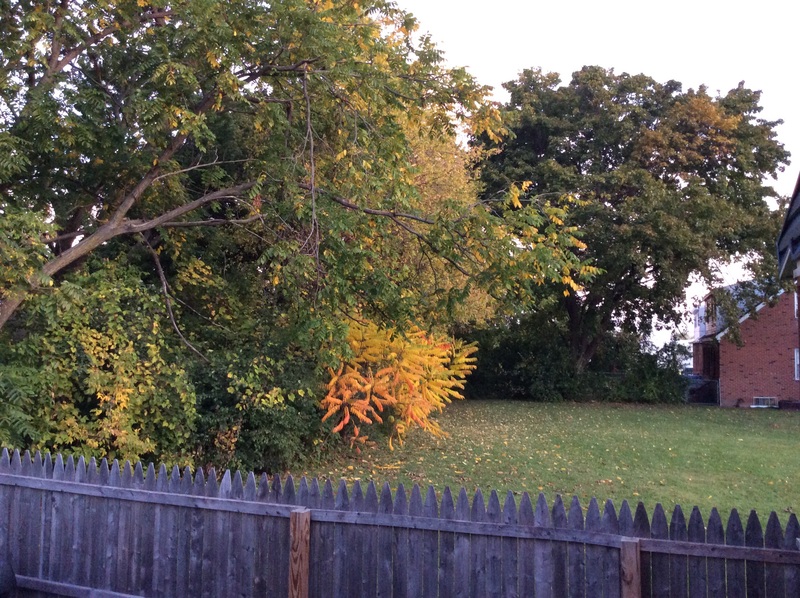 There are a lot of gold hues outside my window now, with splashes of red and russet. Hubs and I spent the day outside securing the garden, getting ready for the chance of high winds from Hurricane Gonzalo tonight. Thanks for sharing pics from your door. I hope you fastened and Gonzalo left your garden unscathed, Jennifer. I enjoyed sharing my view with you! Meandering is a great thing, I always feel that way, my friend. I love the word swiveler, and the image it inspires about your approach to life in and out of your cottage, Beth. Yes, of course it was inspired by our classic CCR song! 4% hot and sweaty and hot and sweaty and how is anyone supposed to wear his Halloween outfit to the Fall Fest at the the fire station tonight when it is so excruciatingly warm?? In B’ville, there’s more color than in Eastwood. Fifteen miles mean a lot around here, Ermigal, I know. Enjoy the walk, my friend. I definitely notice everything around me, much to my chagrin when I almost run people and things down with my power chair, but am learning to stop when I look around now after the last close call. Here in town the color change is about 10%, but out in the country it is prettier, 20 to 40%, depending on how close the trees are to each other and the roads. Saw a large golden presence yesterday for the first time in weeks, but was assured it wasn’t dangerous–it was sunshine showing for the first time in 3 or 4 weeks after rain and clouds seemed destined to last forever. Lovely sight when I got used to it. I’m glad you got some sun back, Angie. Yay. Wow, you are relentless on your banging on the Florida lack of seasons and bad winter January, Rachel. You hate it. I don’t know why you stay there, my friend. Other than Michelle and your two kids, that is. 🙂 Oh, well. I think if I left, Michelle would move with me and my kids would soon follow. I do plan on going back to NY in the next few years if not sooner. The only real thing I do not like about up there is the cost of living is so expensive but the wage comparison is actually a little less. So fr now, that’s kind of why I stay and also why I sometimes feel stuck. LOL! Mark … It’s green as far as the eye can see in Florida. That’s just the way the seasons roll around here. The good news is: the ocean is just a short drive from our door. We spent the weekend with our grands exploring some of the coast – space and treasure. I do envy the display of fall colors you’re enjoying. Thanks for sharing the photos. 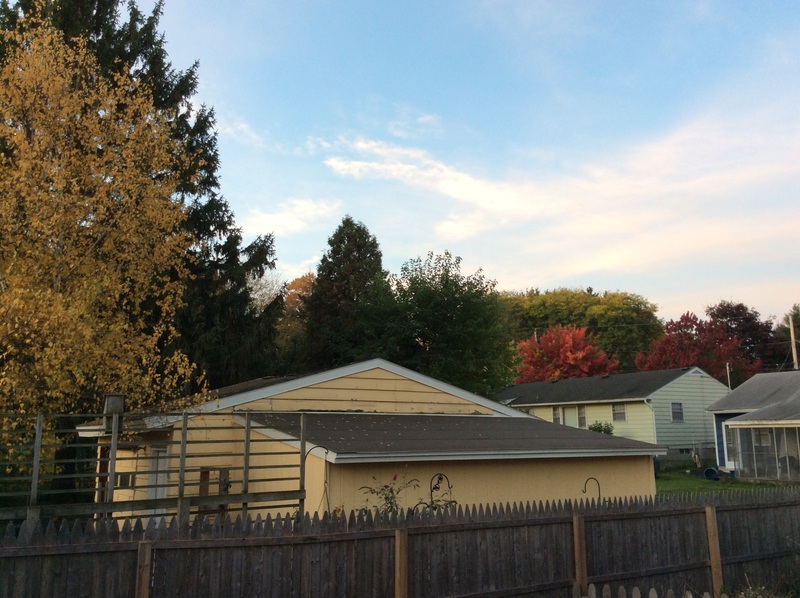 That’s one of the gifts living up state . . .uh…er . . .in central New York the foliage change is always breathtaking. 80-85%, I’d say. interesting Q on how we move forward. I spent the first 35 years of my life doing exactly what I was supposed to do, rarely stopping to smell roses or enjoy leaves turning and certainly never veering from a planned course. Then something snapped in me and I went down a terribly dark alley (oops) and almost lost my way. So now I try to enjoy the wander more and tend to do a lot more zig-zaggnig. Dang, Liz, it took my trip through the awful dark alley to get to my great place now, too, which includes the more open eyes and mind. Same age bracket as you, too. Kindred, indeed. Wow, I’ve missed your blog. I’m finally getting caught up with blog reading. It’s so important to take in our surroundings, especially during the beautiful fall season. Fall is my favorite time of year. Supposedly the colors are peaking right about now, but it doesn’t look it. I can’t give it a percentage, but I can just say- not colorful enough. We’ve had slow colors this year, all anecdotal, certainly, but I call ’em as I see ’em, as you know, Samara. So glad you are wading your way back to me, my friend! Foliage has been gorgeous for past week but seems to be falling fast! Glad to see that fence of yours is in good working order:).